Sound change puzzle, this one using pairs of words connected by a drawl. MORE to MOWER, HEIGHTS to HYATTS, WRITERS to RIOTERS, it's fun to see the transformations of one real word into another real word. Ah, except SURE to … SHOER — that's not as much of a real word in usage as the others. I give that a pass though, as the resulting themer is funny: PRETTY SHOER as [Attractive blacksmith at a stable?]. As with all PB puzzles, the execution is clean. Very few gluey bits, only the minor kind of GOGH (feels partialish compared to VAN GOGH) and PRU sort of thing. Executing cleanly on a Sunday grid is perhaps one of the hardest construction tasks out there, and PB does it so well. I appreciate that PB almost always sticks to a 138 or 140 word grid. It's so difficult to get down much lower than that without compromising cleanliness to a level which starts to take away from my solving enjoyment. 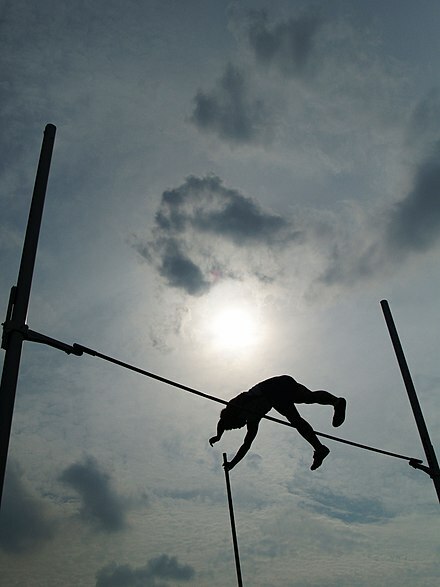 POLE VAULT is an [Attempt to pass the bar?] in a kooky way. I've seen variants of [Cold shower?] for SLEET before, but I still like the wordplay. Some of these might be Will or Joel's clues, but I tend to see a lot of outstanding wordplay in PB's puzzles in general. Just a few of these dotted throughout any puzzle increases my solving pleasure tremendously, and that's even more important in a Sunday-size grid where my attention often wanders. Answer summary: 11 unique to this puzzle, 1 debuted here and reused later, 3 unique to Shortz Era but used previously. Average word length: 5.33, Scrabble score: 593, Scrabble average: 1.61.